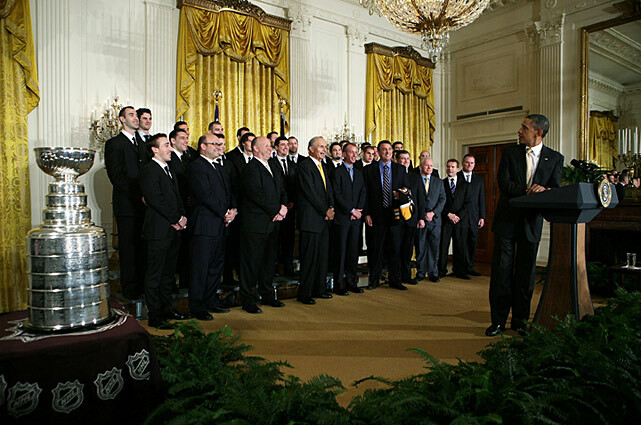 Derrick Henry is in Washington, D.C., today to give the closing prayer at the annual National Prayer Breakfast, and before the event began he met up with President Obama. 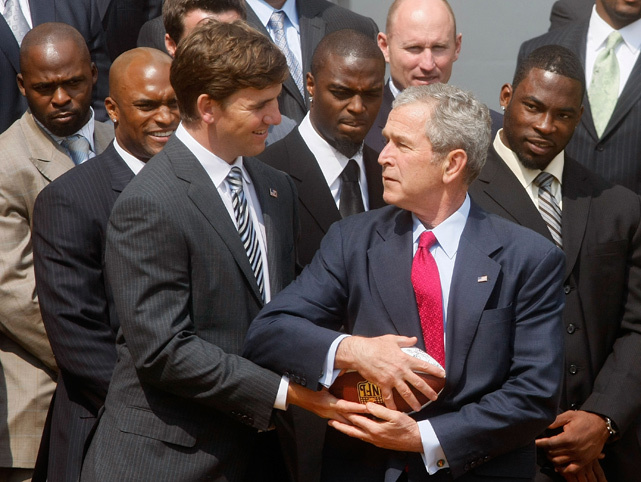 Derrick Henry visited Washington, D.C., on Thursday to give the closing prayer at the annual National Prayer Breakfast, and before the event began he met up with President Obama. 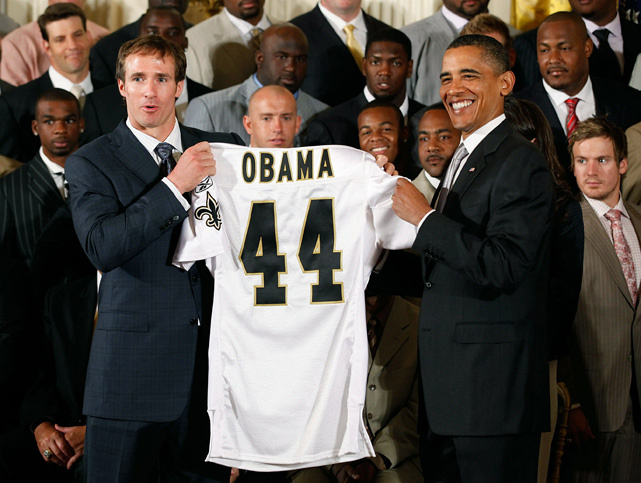 Obama being a big sports fan, he could not pass up an opportunity to strike the Heisman pose with the 2015 Heisman winner. 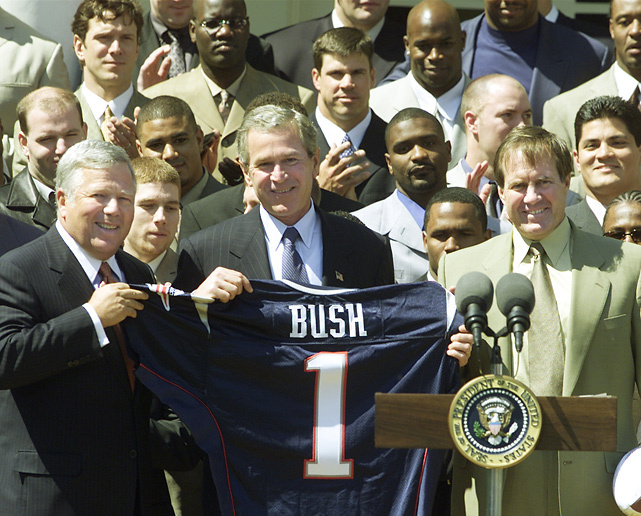 • How successful were Jim Harbuagh’s recruiting stunts? 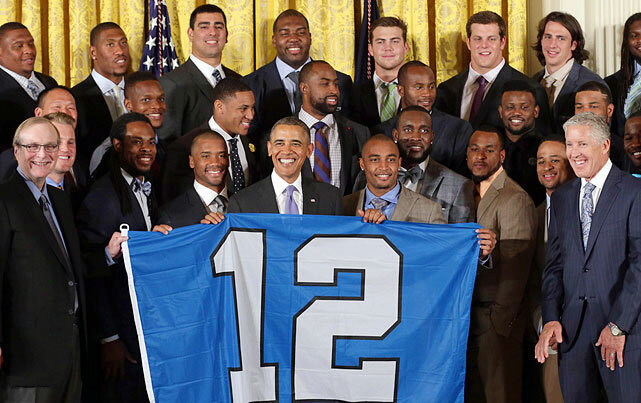 From Joe DiMaggio visiting President Eisenhower in 1953 to the UConn women pulling out the bunny ears on President Obama in 2013, here is a historical look at athletes visiting the White House, beginning with the Super Bowl champion Seattle Seahawks on May 21, 2014. 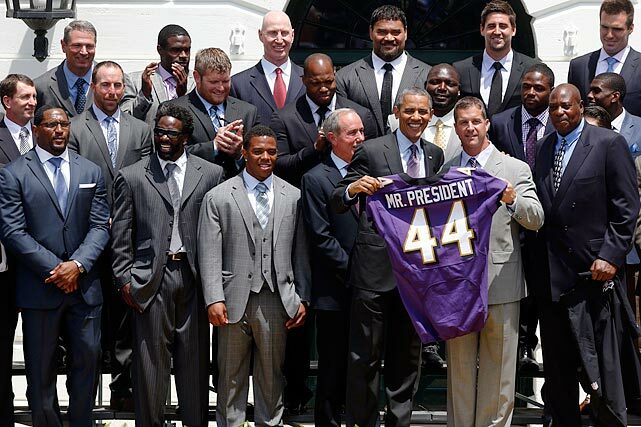 On June 5, 2013, the Ravens celebrated their 2012 championship season with a trip to the White House. 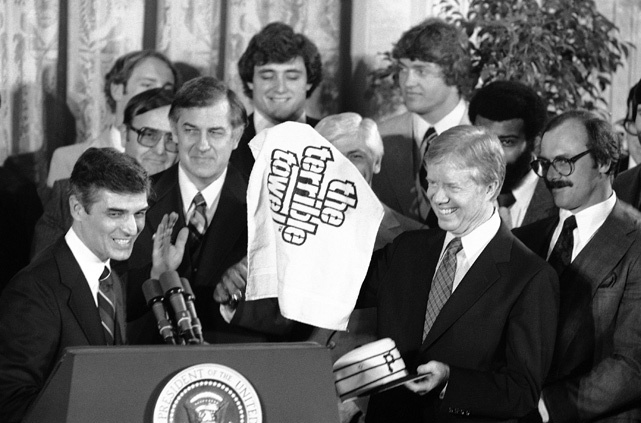 The 1972 Miami Dolphins have finally received their White House moment, 40 years after their historic undefeated season. 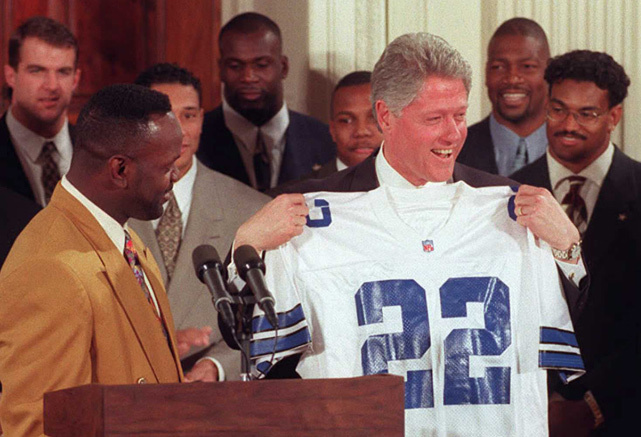 It was a long wait for a Super Bowl championship team whose feat of 17 games without a loss has been unmatched in the NFL. 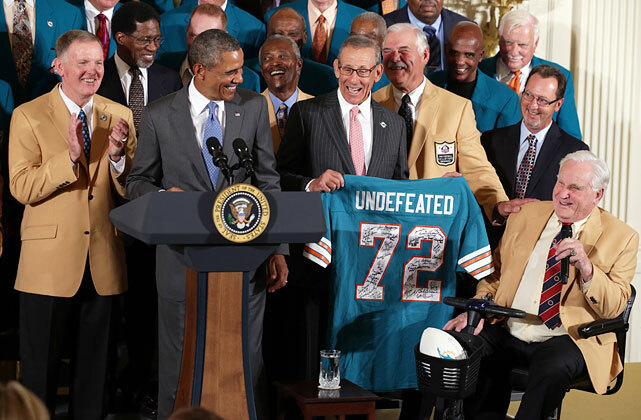 President Barack Obama welcomed former team members and their then-coach, Hall of Famer Don Shula, at a White House ceremony Tuesday, Aug. 20, in recognition of their perfect season. 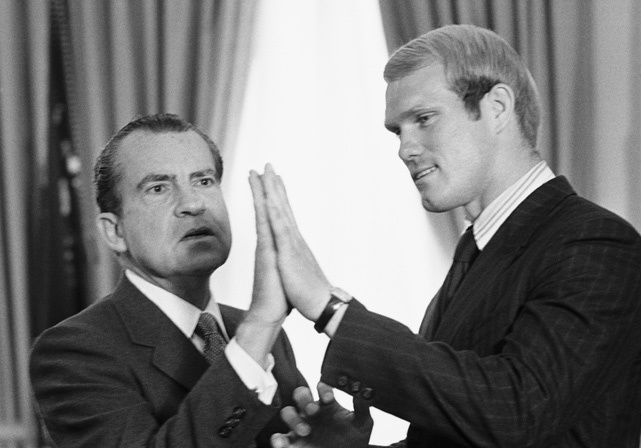 Among those present was the team's star fullback, Hall of Famer Larry Csonka, who made the trip from Alaska. 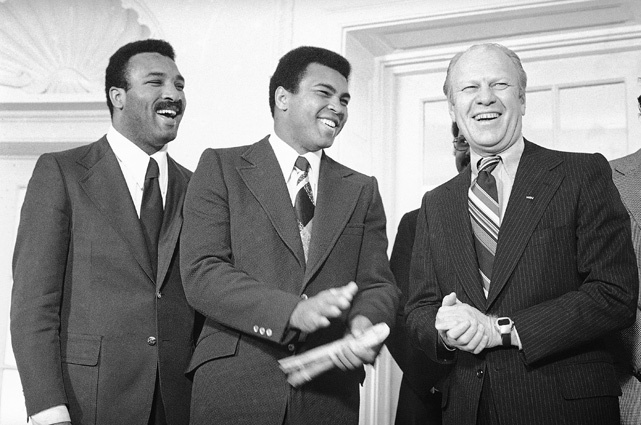 The '72 Dolphins beat the Washington Redskins in the January 1973 Super Bowl. 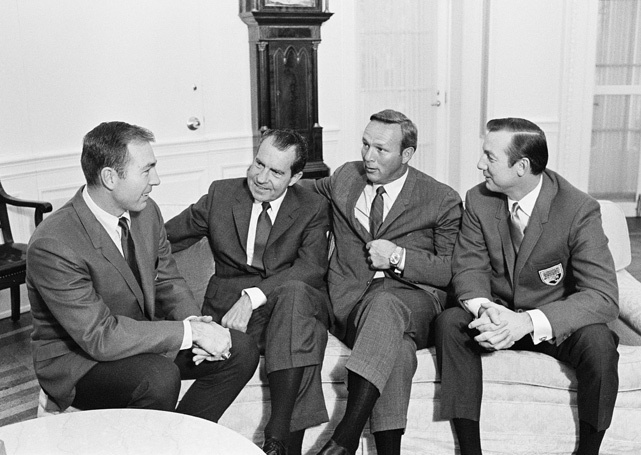 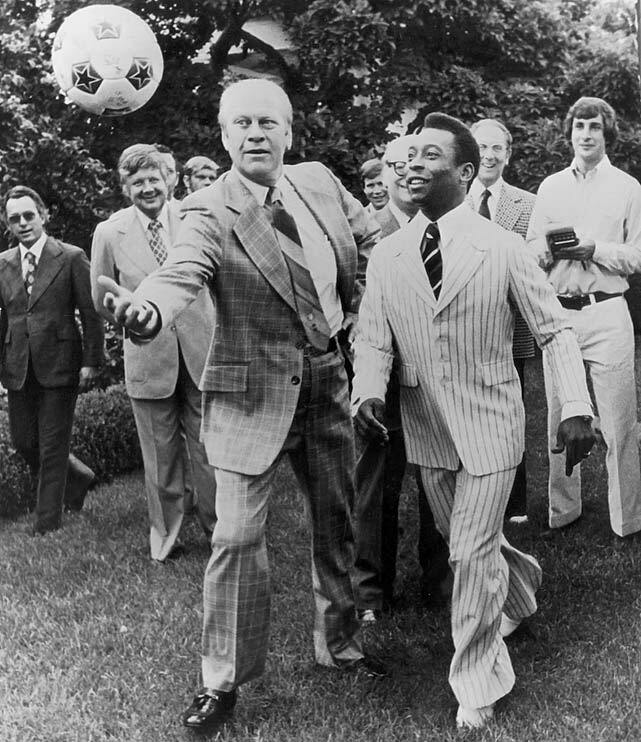 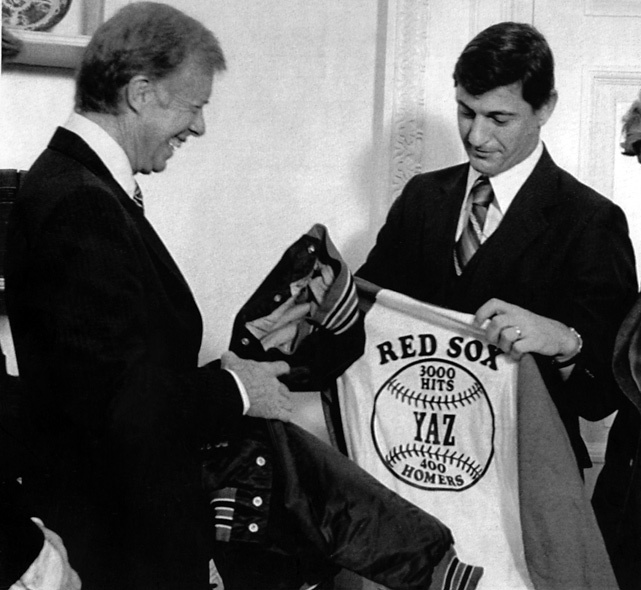 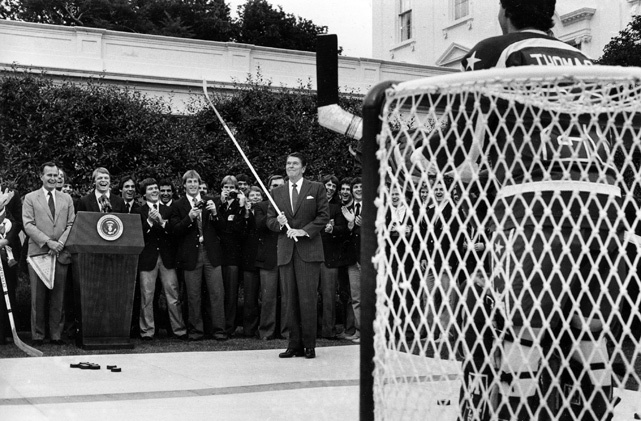 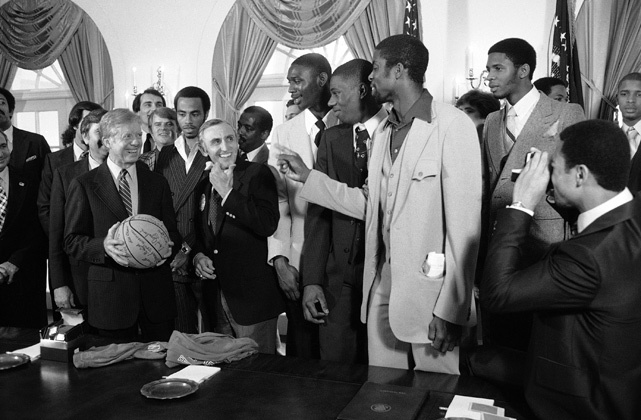 But in 1973 President Richard Nixon was preoccupied with the Watergate scandal, and White House salutes to sports teams were less of a tradition than now. 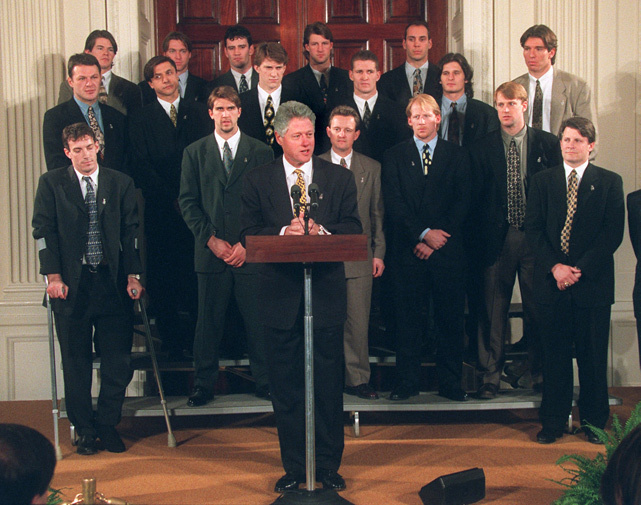 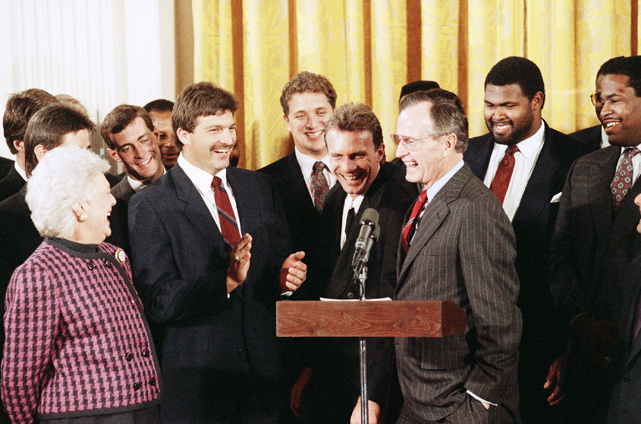 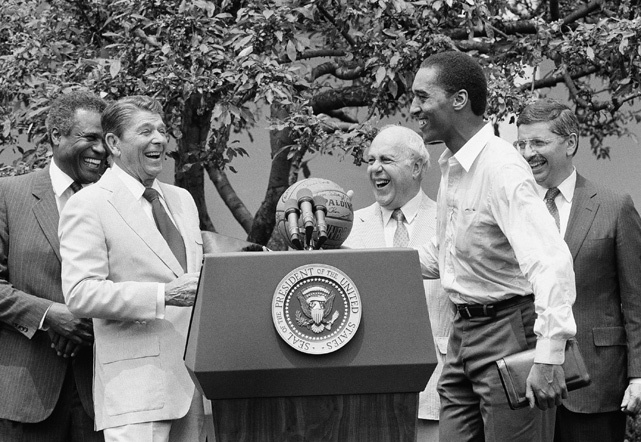 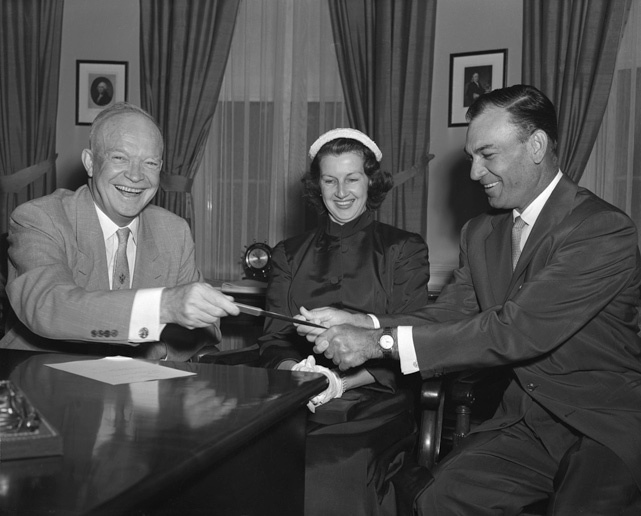 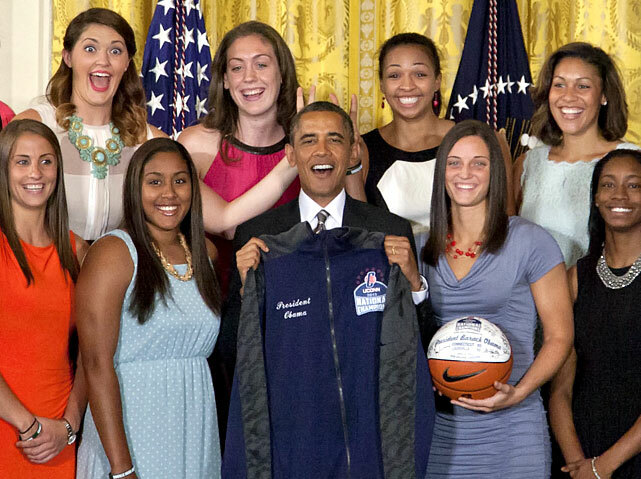 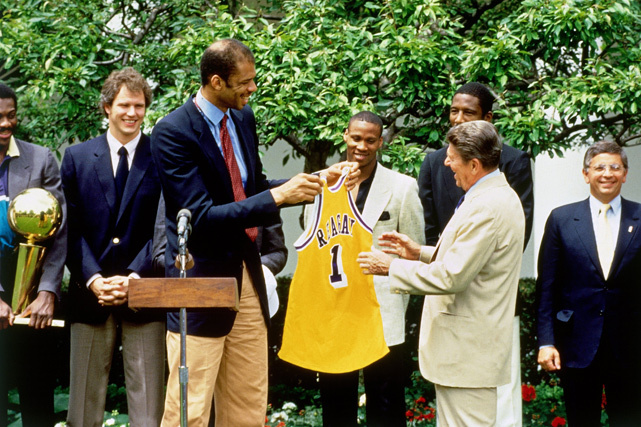 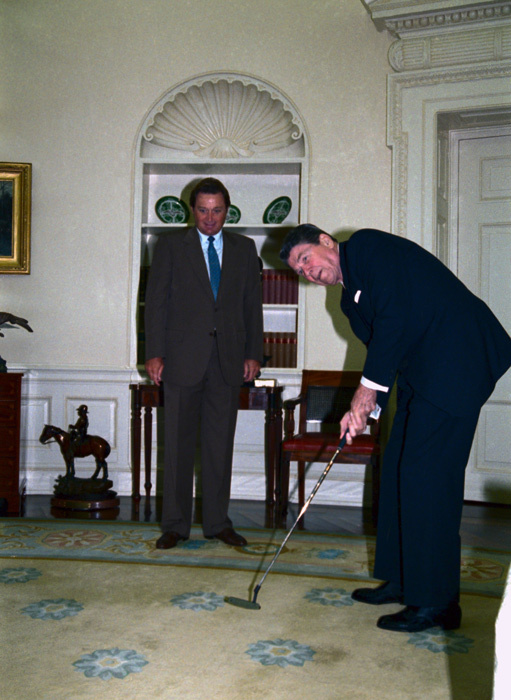 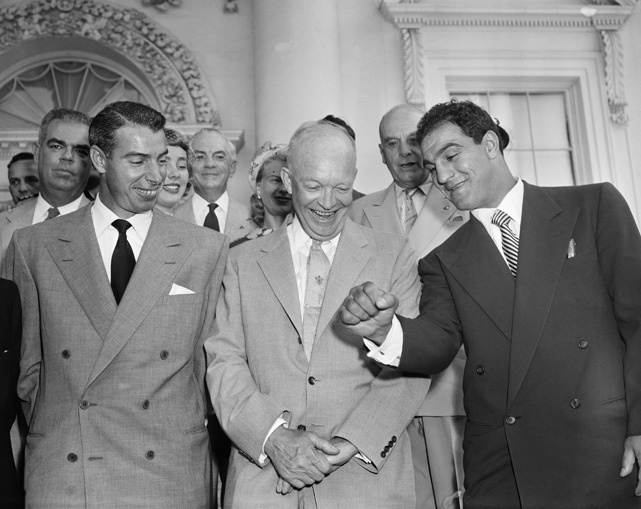 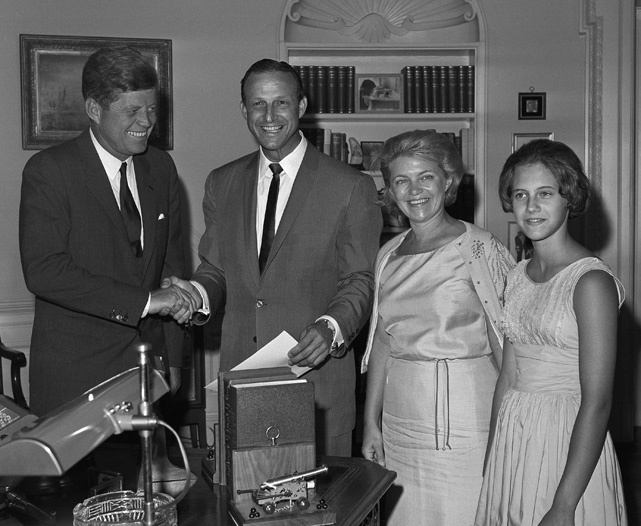 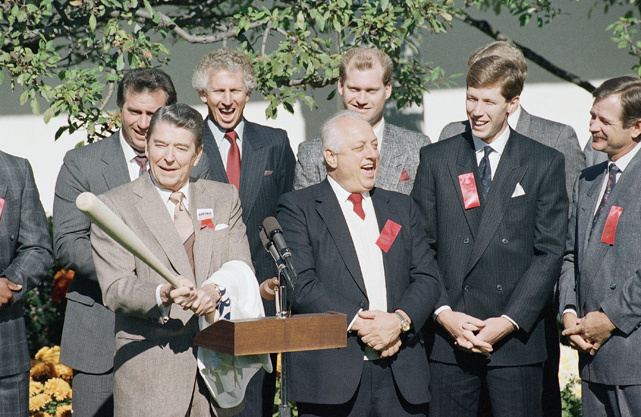 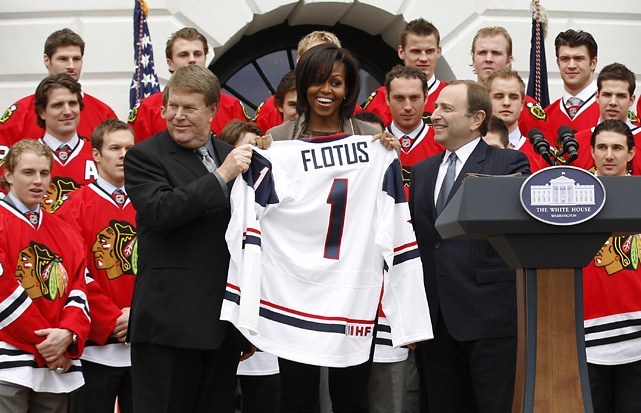 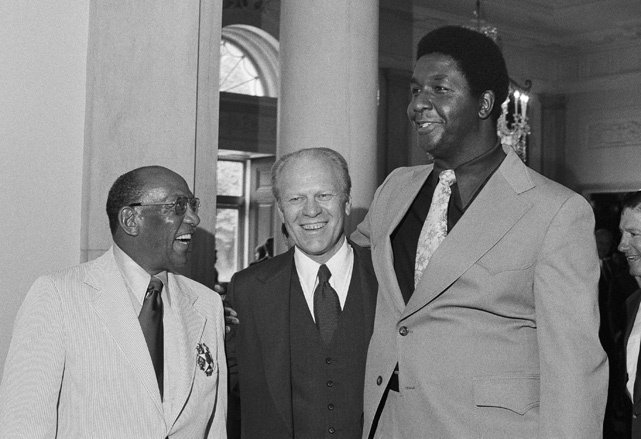 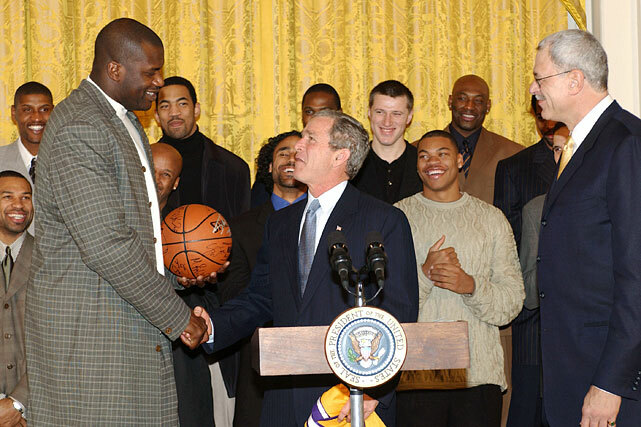 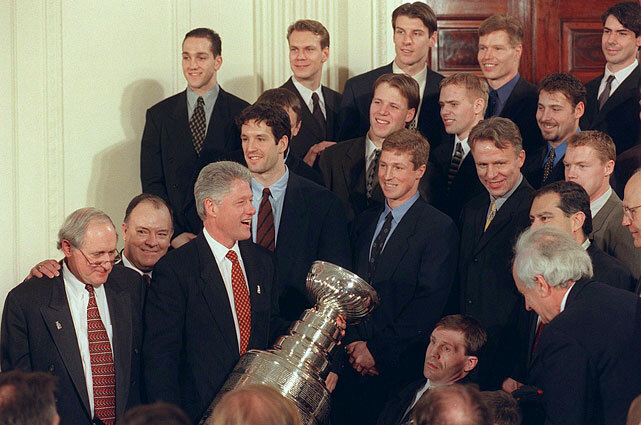 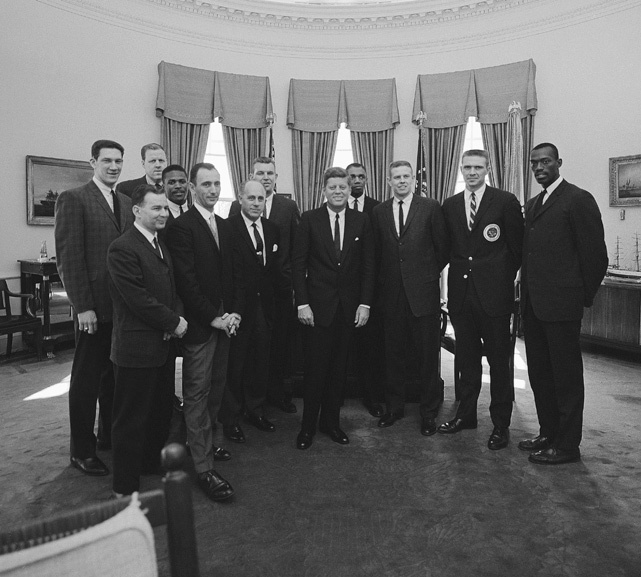 From Joe DiMaggio visiting President Eisenhower in 1953 to the UConn women pulling out the bunny ears on President Obama in 2013, here is a historical look at athletes visiting the White House. 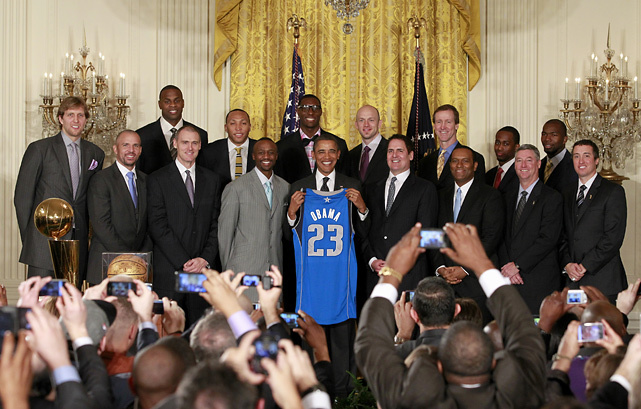 President Barack Obama welcomed the Miami Heat to the White House to honor their 2013 NBA championship on Tuesday Jan. 14, 2014. 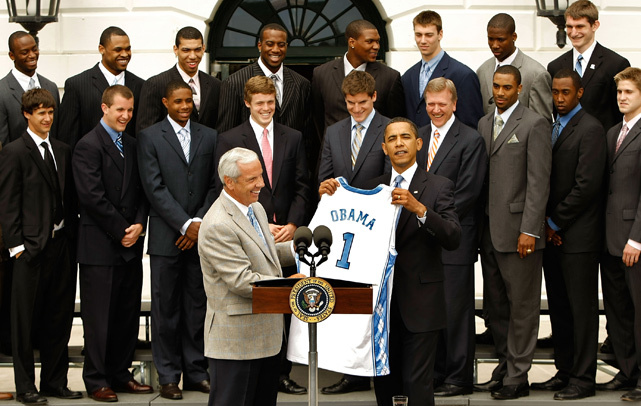 The presidential visit marked the second in a row for Miami, who met with Obama to celebrate their 2012 title last year. 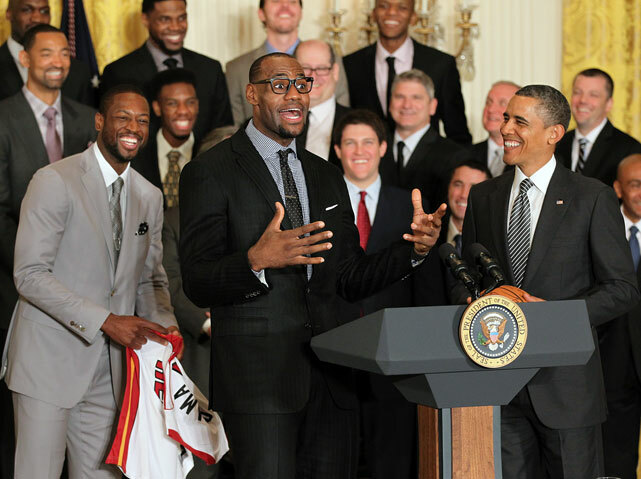 Obama delivered a speech that lasted for more than seven minutes and included a number of one-liners at the expense of various Heat players. 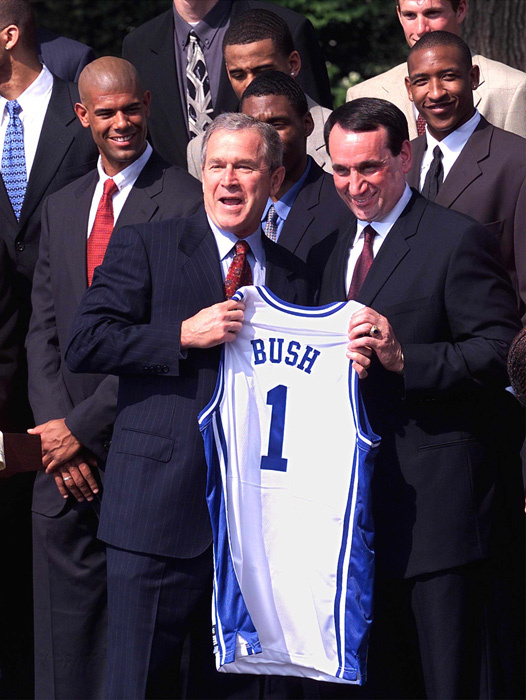 As always, the former Illinois Senator got in a few lines about his beloved Bulls, too. 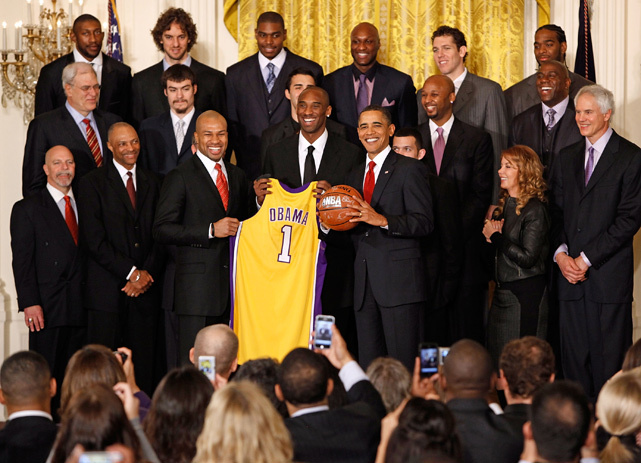 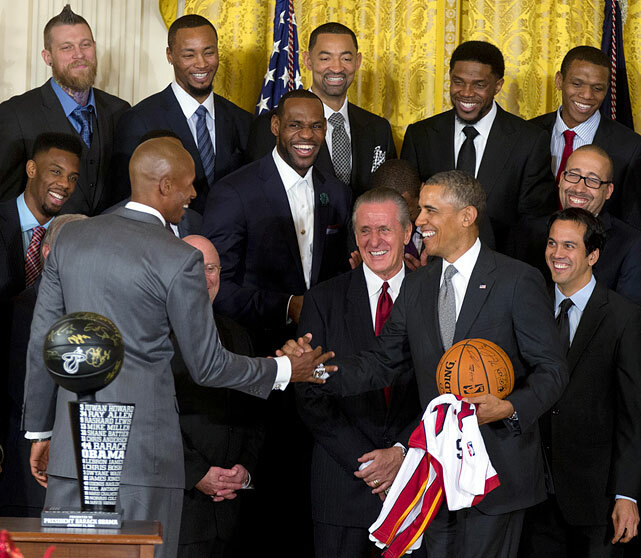 The Heat also presented Obama with a trophy and a personalized jersey as part of the ceremony. 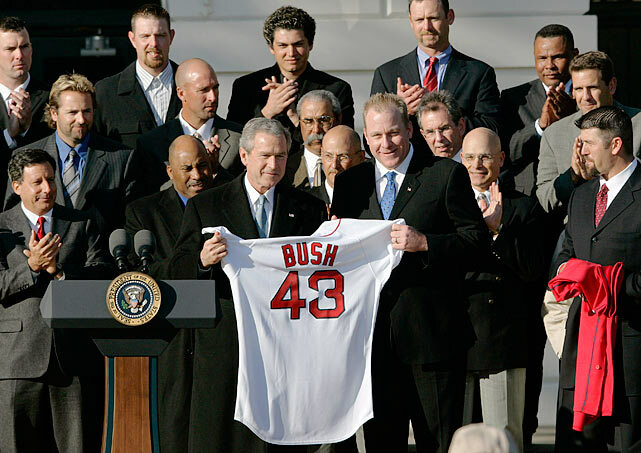 President Barack Obama welcomed the Boston Red Sox to the White House to honor their 2013 World Series championship on Tuesday April 1, 2014. 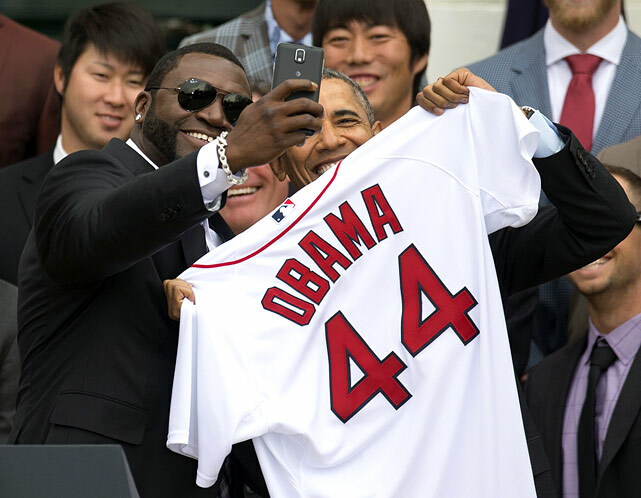 "Big Papi" David Ortiz even took a selfie photo with the president and wasted no time tweeting it. 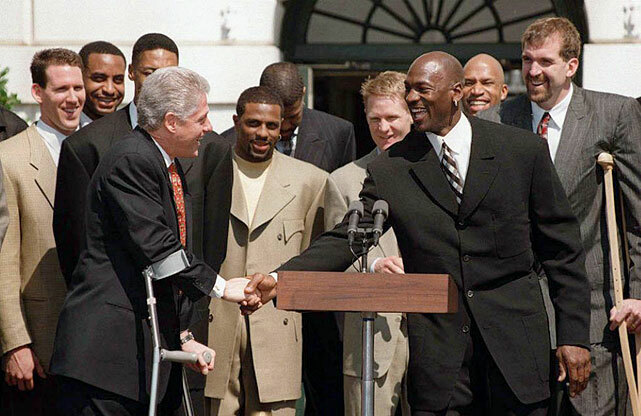 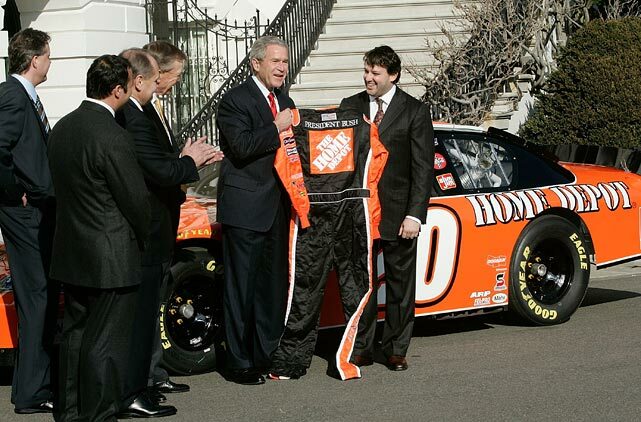 Henry and the president will likely be meeting again soon, as the National Championship team traditionally makes a visit to the White House to meet the president.